Cedric Thorpe Davie was born in Glasgow in 1913, and after studying in London at both the Royal Academy of Music and the Royal College of London, as well as spending some time abroad in Budapest and Helsinki, he returned to Scotland to work at the Scottish National Academy of Music (now the Royal Scottish Academy of Music and Drama) in Glasgow. In 1945, Davie moved north to St Andrews to help build the music department at the University of St Andrews. He remained at the University until his retirement in 1978. In his lifetime, Davie composed more than 200 pieces of music, including scores for films, radio, and theatre. Some of his film works included scores for The Green Man, a comedy starring Alistair Sim, The Dark Avenger, starring Errol Flynn, and Kidnapped, a Walt Disney film featuring James MacArthur and Peter Finch. His radio credits included The King of Nowhere and A House is Built. Davie also worked with Tyrone Guthrie and Robert Kemp to develop theatrical productions, including Ane Satyre of the Thrie Estaites, which opened the second Edinburgh Festival in 1948. In addition to his musical compositions, Davie authored several books, including Musical Structure and Design and Scotland’s Music. In 1953, he wrote the score for the Walt Disney production Rob Roy: the Highland Rogue. 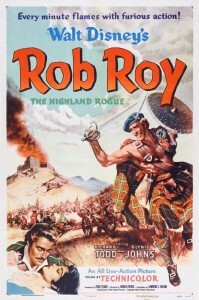 The film, starring Richard Todd (as Rob Roy) and James Robertson Justice premiered in the UK in October with a Royal Command Performance. To further the production’s Scottish connections, the extras cast as the English Redcoats were real-life soldiers, the Argyll and Sutherland Highlanders. Recently returned from the Korean War, the units were loaned to Disney by the Scottish Command of the British War Office. Upon his death in 1983, Davie left his manuscripts and some of his original compositions to the University of St Andrews. This collection includes his notes, early student work, and his arrangements for University choir and orchestra performances. It serves as a testament to his prolific and varied career, as a member of the University, the community of St Andrews, and a well-known figure in music.